Arlington police are still searching for a group of suspects who they believe crashed a pickup truck through the front door of a business, then absconded with an ATM. 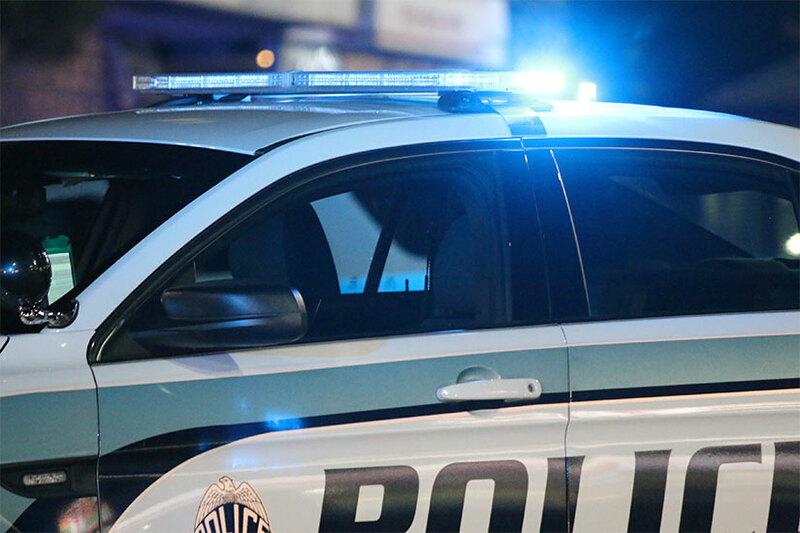 County police say the robbery happened just after 3 a.m. last Friday (Sept. 7) at a business along the 1100 block of S. George Mason Drive, near the road’s intersection with Columbia Pike. The block is home to both a Wells Fargo bank branch and a Liberty gas station. According to a county crime report, employees saw a “large white pickup truck” back through the storefront. Anywhere from three to four people then jumped out and threw the machine into the truck’s bed, before speeding off. GRAND LARCENY (Significant), 2018-09070042, 1100 block of S. George Mason Drive. At approximately 3:32 a.m. on September 7, police responded to the report of a robbery just occurred. Upon arrival, it was determined that the employees of a business observed a large pick-up truck back through the storefront, causing damage. 3-4 suspects then exited the vehicle and forcibly stole an ATM machine with an undisclosed amount of cash, placed it in the truck and fled at a high rate of speed prior to police arrival. The suspects are described as being dressed in all black and wearing black masks. The vehicle is described as a large white pick-up truck. The investigation is ongoing. UNLAWFUL ENTRY, 2018-09080258, 700 block of 22nd Street S. At approximately 11:50 p.m. on September 8, police responded to the report of an unknown male inside the victim’s residence. Upon arrival, it was determined that the female victim located the unknown male suspect asleep inside her residence and items inside tampered with. Nothing was reported missing. Matthew Agvent, 24, of Arlington, VA, was arrested and charged with Unlawful Entry. INDECENT EXPOSURE, 2018-09080027, 2700 block of Wilson Boulevard. At approximately 1:46 a.m. on September 8, police responded to the report of a suspicious person. Upon arrival, it was determined that the suspect entered a business at closing time and was denied service. The suspect then entered the bathroom, leaving the door ajar, where the victim observed him masturbating. After being asked to leave the business repeatedly, the suspect fled on foot prior to police arrival. The suspect is described as a white male, approximately 5’11”, with an athletic build, defined jawline and round cheekbones, with stubbled facial hair, wearing a striped polo shirt with a white t-shirt under it, a brimmed hat, khaki pants, dark colored boxers and had a tattoo on his back. The investigation is ongoing. PEEPING, 2018-09080030, 2300 block of 11th Street N. At approximately 2:29 a.m. on September 8, police responded to the report of a peeping. Upon arrival, it was determined that the female victim was inside her residence when she observed the male suspect in the bushes outside the window allegedly looking inside. The suspect fled prior to police arrival. The suspect is described as a white male, approximately 25-40 years old, 5’5″-5’10”. The investigation is ongoing. ATTEMPTED BURGLARY, 2018-09090133, 1400 block of N. Rhodes Street. At approximately 5:24 p.m. on September 9, police responded to the report of an attempted burglary. Upon arrival, it was determined that the victim was inside his residence when he heard someone attempting to gain access. The victim then made contact with the suspect and escorted him off of the property. The suspect fled the scene walking north on Rhodes Street prior to police arrival. The suspect is described as a dark skinned male in his 30’s, approximately 5’6″-5’8″, wearing a black skull cap, black and white pants, a dark gray short sleeved t-shirt, black boots, carrying a black backpack and wearing a light colored towel or t-shirt around his neck. The investigation is ongoing. INDECENT EXPOSURE, 2018-09050097, Washington Boulevard at N. Kirkwood Road. At approximately 12:20 p.m. on September 5, police were dispatched to the report of an indecent exposure just occurred. Upon arrival, it was determined that the female victim was walking in the area when she observed the male suspect with his pants pulled down, exposing himself and masturbating. The suspect is described as a white male, wearing light-washed blue denim shorts or pants, and black shoes. Arriving officers canvased the area with negative results. The investigation is ongoing.